Poet Scot Slaby sent me a copy of his chapbook The Cards We’ve Drawn (Bright Hill Press, 2014) to read and I want to share it with all you tarot enthusiasts out there. I very much enjoyed it and read it through cover to cover several times. These are poems that can really tug on your heartstrings, even more so for the tarot enthusiast who can truly appreciate the depth of Slaby’s lines. 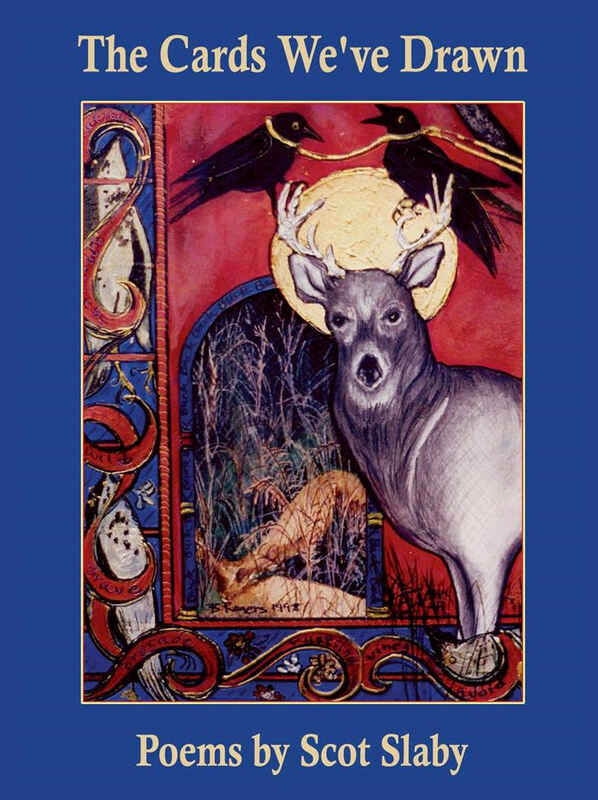 The first part of the book consists of 11 poems, each poem expressing one card and position in the Waite Celtic Cross spread. Of all signifiers, it’s the Knight of Cups. What is it with poets and the Knight of Cups? =) No, seriously. The Knight of Cups frequently appears in readings I do for poets. What I really love about Slaby’s poems here are how they serve as amazing meditations on each of the given cards, and meditations from a poet’s perspective. 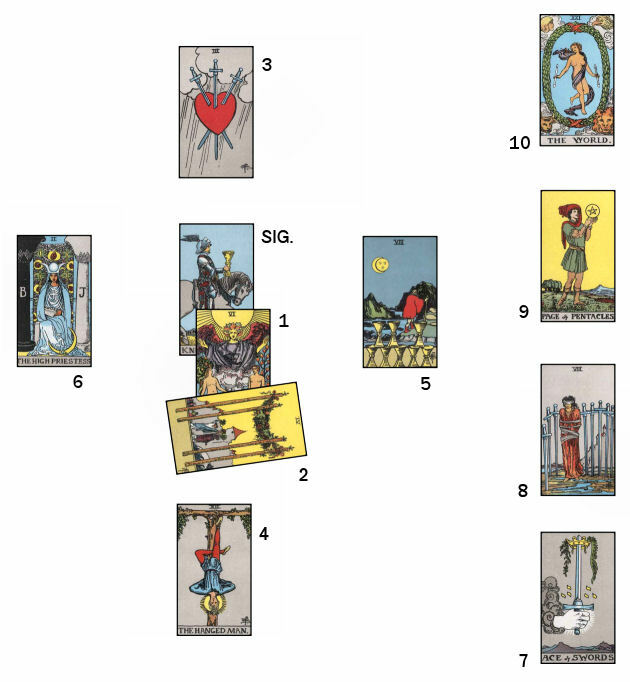 From my experience and interactions, poets are the most observant of people, and so we tarot practitioners have a lot to learn about tarot cards from poets who observe them. That’s what’s most intriguing about the book: seeing these same Rider Waite cards I’ve been looking at for decades, but through a poet’s perspective. Yet together, the cards also express a heartbreaking love story that is woven through the eleven poems, about the eleven years shared between two lovers. …with madness you’re paid back in spades. Slaby’s expression here for the card is definitely worth integrating into any tarot practitioner’s journal notes. You bet I did. Purely from a practitioner’s perspective, his interpretive framework is fascinating. Joyeuse is King Charlemagne’s personal sword, which according to legend, houses the Holy Spear. Hauteclaire is the name of Oliver de Vienne’s sword, a knight from the French epic poem “The Song of Roland,” dated around Charlemagne’s time, and Durendal is said to be the sharpest sword in the world, having come straight from the angels to Charlemagne, who then gave it to Roland, one of his most trusted military leaders. I love thinking about the three swords in the Three of Swords as Joyeuse, Hauteclaire, and Durendal. The Cards We’ve Drawn won Bright Hill Press’s poetry chapbook competition and I’m not surprised. Tarot enthusiasts are going to really appreciate this collection of poems. Please consider supporting the amazing publisher Bright Hill Press and Slaby’s work. You can order the chapbook for $10. Be sure to check it out! How interesting and very original!